Another important factor that makes Flutter more fruitful for mobile app development is the cost of mobile app development. In Flutter, developers can write code once and implement anywhere. The hot reload feature supports a really fast iterative coding style that makes it super productive. Programming is done one time and the code will run smoothly on Android, iOS or Windows and features provided by Flutter framework is really appreciated by the mobile app developers. Website developers can easily get into mobile app development domain without the need to learn different native platform languages. Enterprise can reach out to a maximum number of users with minimum budget. Helpful for developers to develop high-end mobile apps with eye-catching UI. Another really great aspect of flutter is its really rich catalog in-built catalogs. Material Design(for Android) and Cupertino( for iOS) are two great set of widgets that can be easily implemented as per developer requirement. Flutter is the only mobile app development framework with its own inbuilt widgets. Developer finds flutter a faster & more dynamic way for mobile app development. It is possible to do changes in code and watch then straight away how they work inside app due to Hot reload feature. Using this within few milliseconds developer can include features, and fix the bug. The code for 2 apps will be written only once and it will cover both platforms Android and iOS. Flutter is independent of the platform due to Flutter’s widgets and design structure. As there is one app for both the mobile platforms so testing time is considerably less. This eventually speeds up the entire quality assurance process of Flutter app development as a single codebase means developers need to write an automatic test simply once. This way a considerable amount of developers time is saved. Even the older version of Android and iOS will let the app look and feel the same as it is on the latest version. Interestingly, no need to pay an extra cost for support of the old device. Flutter will prove to be most friendly of all if you want to develop an MVP (Minimum Viable Product) for your App and share it with your client. Flutter has its own library of widgets that can be customized to give a very close look and feel to a native app. None other framework has the advantage of this feature. Dart is the programming language of Flutter and developers hold very good reputation about it despite only very less time has passed since its introduction. Dart is very expressive and type-safe. 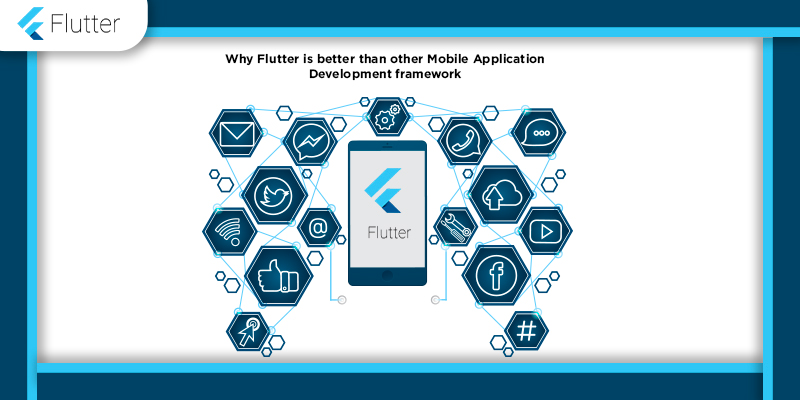 Flutter is not simply a framework rather it is a complete SDK that has all features like inbuilt widgets, integration & testing APIs, rendering engine and command line tools to develop a cross-platform mobile app. Author Bio: Amir Khan has a natural knack towards contributing in the form of writing. He believes expressing technology in simplified words is deeply coded in his DNA and making it available for everybody is his duty. He reads a lot on everything under the sun to ensure he puts himself in reader’s shoes and explore opportunities to wow his reader as much as possible. ← 6th March Google Search Ranking Algorithm Update?